Forums » General Help and Questions » A way to add number of adults/children in the rental agreement? A way to add number of adults/children in the rental agreement? It would be great if I could use OR renter agreement, but i noticed that the only option to fill in the number of adults and children is to have it default to what is on the initial inquiry - which is often incorrect(traveler may select default 2 people or omit children on various sites). Is there a way to add fields to renter agreement so that renter is forced to enter/update them before hitting "accept"? Otherwise I have to continue to use signnow for renter agreements where I can have them initial every page and fill in adults and kids. The renter agreement fields are actually based on the BOOKING field codes (or adult/child or whatever else) and not the quote or inquiry. After a booking is created, the legal agreement is stamped with the field values that are current for the booking at the time the legal agreement is made. If you were to send the guest another copy of the legal agreement to signed later on (even if they already signed on), it would attempt to render the agreement body with the current field values. So you could update the booking and re-send the legal agreement link for them to sign again. Now in terms of the quote acceptance workflow... Yes, whatever adult/child value is set on the quote at the time the guest goes to book, that will pass along to the booking and the legal agreement will show that. So if the quote adult/child counts are wrong, the initial legal agreement will show the wrong ones. But it's on the guest to see that and know they are committing to (and signing) a legal agreement that show a certain number of guests. If they're lying about the numbers, or made a mistake, they should see that. You could always highlight this at the top of the renter agreement so they see in bold the numbers they are committing to. 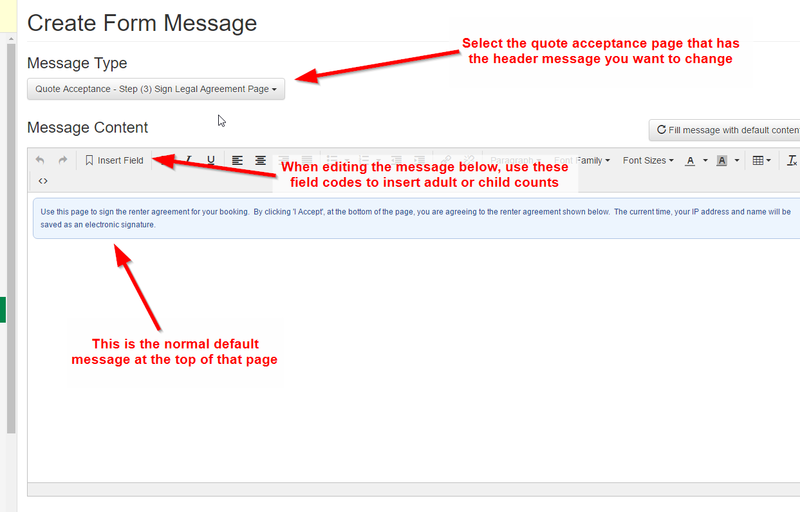 You could also include header information on the pages BEFORE they get to the legal agreement telling them to make sure they are correct and contact you to change the quote (or go back to the Book Now widget and use right numbers) before getting to the legal agreement. If you edit the form headers, you can embed booking field codes there. Thanks Michelle for a prompt reply. Where/how do i edit form header to warn renter to populate number of people vorrectly? Thanks! Oh, very sorry... I just noticed that the field code list for Form Messages does not include booking field codes, only account and property level ones. We do actually have booking field codes for Form Messages working in **development**, but that was never released. So you would not (currently) be able to show the guest the adult/child numbers yet. You could, however, at least draw their attention to the fact that they need to check them. Like "MAKE SURE ADULT/CHILD COUNTS ARE RIGHT" which are available in the renter agreement. We will have that updated live in the near future so that booking field codes are inserted in Form Messages.